A group of academics believe they have found the battlefield where the concept of 'Englishness' was born. The bloodbath at Brunanburh in 937 AD was fought by King Athelstan when he united the Anglo-Saxons for the first time to fight off a Viking invasion. 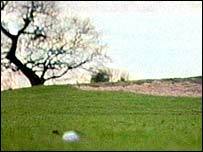 The research claims that the site of the battle mentioned in the Anglo-Saxon Chronicle was on what is now a golf course in Bebington, Wirral. It is thought the exact location has been a mystery for more than centuries. Professor Stephen Harding, from Wirral, told BBC News the golf course would have been the scene of "absolute carnage". The amateur historian added: "We believe it was probably the site of the Battle of Brunanburh which was one of the bloodiest of battles to have taken place in the British Isles." The two place names referred to in The Anglo-Saxon Chronicle as being the sites of battles are Brunanburh and Dingesmere. Brunanburh could have been Bromborough, in Wirral, although other locations in Scotland, Yorkshire, Northamptonshire and Lancashire have been suggested by historians. But, until now, Dingesmere has never been located. Prof Harding's research argues that 'Ding' refers to the Viking meeting place or 'Thing' at modern-day Thingwall, off the A551 in Wirral. The Chronicle recounts how the English advanced and began pursuing the invaders up what is now the fairway of the par 4 11th hole at Brackenwood Road golf course. The Anglo-Saxon Chronicle records: "Never yet on this island has there been a greater slaughter. "When it was over Athelstan and his brother Edmund returned to Wessex, leaving behind corpses for the dark black-coated raven, horny-beaked, to enjoy." Prof Harding runs the National Centre for Molecular Hydrodynamics in Nottingham.